Aerobatic flying is a pilot's ultimate challenge. In acrojet we're sharing with you some of the excitement, thrills and split-second action of real aerobatic flying. Don't be dismayed if you crash your acrojet frequently. It's a highstrung and unforgiving aircraft. The key to successful aerobatics is to practice the maneuvers cautiously, safely, carefully and with plenty of altitude. Only then can you attempt them at low altitude. Aerobatic flying is a thrilling and dangerous sport that doesn't get the attention it deserves. we urge you to go watch a real event, see the planes overhead, and talk to the pilots and ground crew. You'll appreciate and enjoy acrojet that much more! 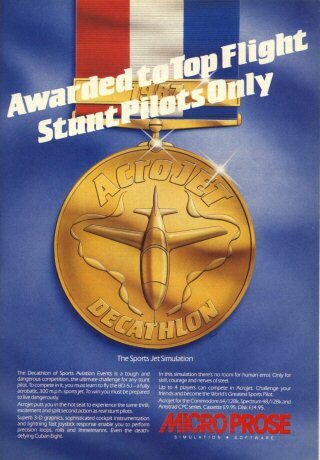 This simulation is dedicated to sport, aerobatic and stunt pilots everywhere in the world. We want to bring you the excitement they feel every time they climb into the cockpit for a competition or just plain flying fun! Although no real pentathlon or decathlon for sport aviation currently exists, continued promotion of sport aviation and aerobatics may produce such a competition in the future. In the meantime, although this simulation aims at realism, please don't attempt any of the maneuvers depicted herein a real aircraft. Aerobatic pilots have years of training and experience. only the best would attempt in real life the maneuvers depicted in this product - low altitude aerobatics is extremely dangerous, with no leeway for human error or mechanical breakdown. Most of all we want you to have fun. we've had fun making this product, and look forward to competing with you in the excitment of an acrojet competition. Good loops to you. Getting a quick start....You can get airborne in your acrojet simulator quickly by following the appropriate loading instructions, reviewing the cockpit layout found midway through the instructions and reading through the description on aircraft controls. Instructions for basic takeoff and landing techniques can be found right after the controls section. Be sure to unlock your planes controls when requested. The lock colors and appropriate lock codes are listed in alphabetical order throughout this manual.